A group of pro-life advocates hold a demonstration on Sanford Mall on Wednesday. The Center for Bio-Ethical Reform displayed the Genocide Awareness Project, an anti-abortion exhibit, on Sanford Mall Wednesday. The project “juxtaposes images of aborted embryos and fetuses with images of victims of historical and contemporary genocides and other injustices,” according to the Center for Bio-Ethical Reform. The display contains claims that abortion is a form of genocide, and that it is comparable to slavery in the United States and the Holocaust. 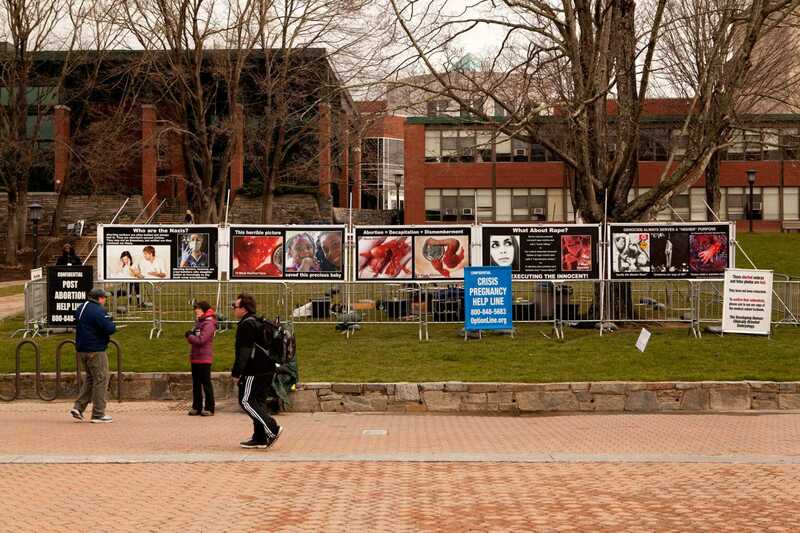 Pro-life proponents hold a rally on Sanford Mall on Wednesday. Some of the pictures included in the project include a fetus that had been aborted after 11 weeks, photos of lynchings in America and images taken from Nazi concentration camps. Several Appalachian students stopped to debate the subject matter with the volunteers. Some of the students disagreed with restricting abortion, others resisted the comparison with the Holocaust and others still were unhappy with the nature of the images displayed. “They could’ve done this a hundred other ways that would have been so much better rather than putting disgusting photos out,” Kimberly Parrish, a senior psychology major, said. For Rose Adams, a junior sociology major, the display was shocking to look at. A representative for the Plemmons Student Union, which organizes events on Sanford Mall, said that despite any disagreements they may have with the content displayed, the First Amendment protects the center’s speech and that it has to be respected. Joanna Keilson, one of the coordinators for the display, said that these images are presented in order to show people that abortion is more than just the clinical terms. Several members of the Center for Bio-Ethical Reform accompanied the display on Sanford Mall and distributed fliers to students as they passed by. One member also had their young children help with the distribution. Fletcher Armstrong, the other coordinator for the display, said that he believed everyone should have a right to talk about the project, whether they are for it or against it. “The First Amendment only works if it works for everyone,” Fletcher said. The group requested that signs designating a “counter perspective area” be placed, according to Jonathan Hyde, the associate vice chancellor and the dean of students. Hyde asked that if any students have issues with the content of the display that they come and talk to him so that he can help them to the best of his ability. The display will be on Sanford Mall until April 5 from 7:30 a.m. to 4:30 p.m. Featured caption image: A group of pro-life advocates hold a demonstration on Sanford Mall on Wednesday.